Verizon and Motorola have finally launched the Droid Turbo, the powerful version of the Moto X, limited to the Verizon network carrier. To be available from October 30th for $199.99 on contract for a 32GB model or $249.99 on contract for a 64GB version, the Motorola Droid Turbo boasts the Quad HD display and it is powered by the Snapdragon 805 processor with 3GB RAM. According to Verizon, the 3900 mAh battery in the Droid Turbo is capable to running for 48 hours before getting discharged, and there is the Turbo Charger included, which is supposed to give a charge for 8 hours of usage, in just 15 minutes of charging. The device will be running Android 4.4 Kitkat out of the box, but Motorola says it will be releasing the Android Lollipop update to it, as soon as the new version of Android is released officially. One big difference from the new Moto X is that the Droid Turbo has three touch buttons out of the display, and thus making the device taller than the Moto X. The color options in which the Droid Turbo will be available, include metallic black, metallic red and ballistic black. The latest best Droid smartphone from Motorola is going to be unveiled on 28th October in New York. Most of the details we shared below, still seem to hold the same value as more leaks are coming out with the specs that were leaked earlier too. Although available on contract, the Droid Turbo will be available for $599.99 without a contract (full retail price). Not the first time we have seen a user guide for an upcoming smartphone leaked, and not the first time we are trusting on that, to figure out about the specifications of that device. After the recent launch of the new Moto X and Moto G, Motorola seems to be prepping up for another powerful device, and this is surprisingly, a lot more powerful and heavy loaded than the flagship Moto X 2nd gen. Motorola’s Droid Turbo is the name, and following are the details one can find in the 74-page user manual. The specifications are taking you on a ride – 5.2-inch display with UHD resolution (yes, that’s 2560×1440 pixels), and with the smaller screen than both LG G3 and Oppo Find 7, the pixel density is higher in the Droid Turbo. Limited to Verizon network, the Droid Turbo will be coming with 4G LTE connectivity. 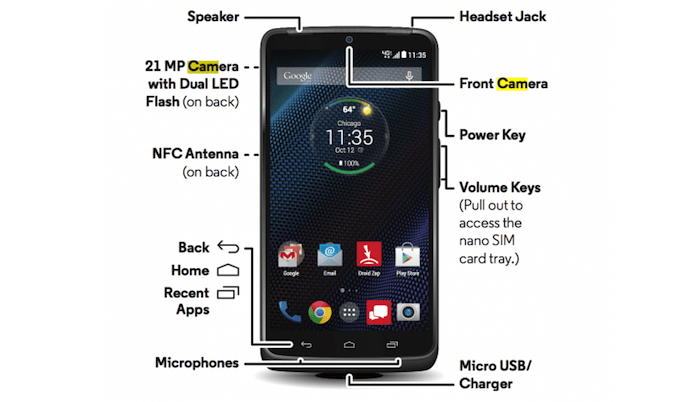 Earlier to this, the information about backplate of the Droid Turbo was leaked, and that is now confirmed with this user guide as there is a 21-megapixel camera on the rear side, with two LED flash lights, one on either side of the camera, but they are not within any ring (like the one in new Moto X) and they are not that close to the lens. Interestingly, the volume rocker buttons can be pulled out with a fingernail and they act as a SIM tray. And because this is with Verizon, the SIM card is pre-installed in the device out of the box. 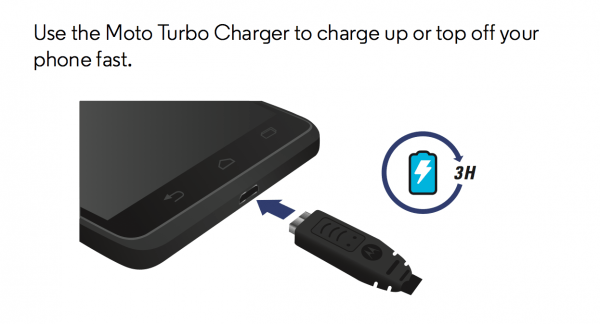 The name “Turbo” has something to do with the charging of the battery, as the specific accessory Moto Turbo Charger is going to come bundled along with this smartphone, and with that, the device gets charged from zero to hundred in three hours. The turbo charger isn’t the only option for charging the device though, as the Droid Turbo has the wireless (Qi) charging compatibility. There is an NFC antenna on the back, thus the connectivity is not limited to Wi-Fi, Bluetooth and 4G LTE via Verizon. This looks very exciting, and we might see this officially announced very soon.